Professional guides might find this sling to be a bit small. But for everyone else, this pack offers generous storage capacity—and keeps it from feeling unwieldy. This is far from a pocketless sack. Whereas some slings minimize the number of compartments for a more streamlined carry, the Large Headwaters is divided into three zippered sections, each with additional pouches inside. The smallest of those is a hard-sized case for a fly box. Some testers don’t love hard-sided compartments because they’re less forgiving about the box you can shove inside. If your box happens to fit, great! But the hard-sided design doesn’t accommodate a too-big fly box. The tippet-holder, however, is one of the best we’ve used. It’s simply an elastic cord and cordlock sewn to a Velcro patch that sticks to the hard-sided compartment. But its placement is perfect—front and center once you swing the pack around to your front—and the design makes it easy to switch out spools. This pack is “Cadillac” plush. A thick (3/4”?) slab of egg-crate foam cushions your back from whatever you’re carrying and improves ventilation (see below). The wide, rigid shoulder and hip straps ably support heavy loads, and the design nestles securely into the curves of your back. One professional guide stuffed it with three liters of water and a full complement of gear and found it comfortable after a full day of wear. Although it’s obviously designed for “Mr. 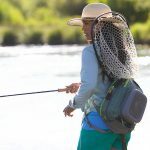 Medium,” this sling does adapt to shorter (to perhaps 5’3”) and taller anglers. The waist strap accommodates large (but not XXXL) waistlines. Its large size means there’s a lot of pack clinging to your body, but Simms does an impressive job of mitigating heat buildup. The main compartment is lined with egg-crate foam and mesh fabric that lets some air circulate between the pack and your back, and the shoulder and hip straps use a honeycomb mesh that’s only mildly sweat-trapping. The 420-denier fabric is coated with a DWR treatment, so it repels drizzle and brief showers. But it’s not waterproof, and wading more than waist-deep will soak the contents. With this pack, there’s always room for one more—one more jacket, one more fly box, or one more sandwich. It holds a lot (15 liters, according to Simms) but it’s still a tad small for professional guides. Self-guided anglers should find its storage more than sufficient, and may appreciate generous storage that still manages to feel streamlined.